Washington state wrestling had great success with the teams that we sent to USAW National Duals this year. We had teams compete in four different groups and all four placed among the top 11 at their respective national tournaments. Female cadets:95lbs-Leah Olsen 7th,108lbs-Brenda Reyna 3rd,108lbs-Vianne Perez 7th,115lbs-Sierra Joner 1st,115lbs-Tommie Mosteller 2nd,115 lbs-Anesia Ramirez 3rd,132lbs-Hailey Hall 4th,154lbs-Abby Lee’s 7th,172lbs-Kacie Moorehouse 3rd,198lbs-Emily Huerta 1st. Junior women’s:105lbs- Brenda Reyna 3rd,112lbs- Marizza Birrueta 1st, 112lbs- Vianne Perez 5th,130lbs-Hailey Huerta 6th,139 lbs-Desiree Zavala 1st,148lbs-Tatum Sparks 5th,172lbs-Kacie Moorehouse 5th,198lbs-Kiaya Van Scoyoc 1st,198lbs-Emily Huerta 4th,198lbs-Ryan Gibbons 7th. 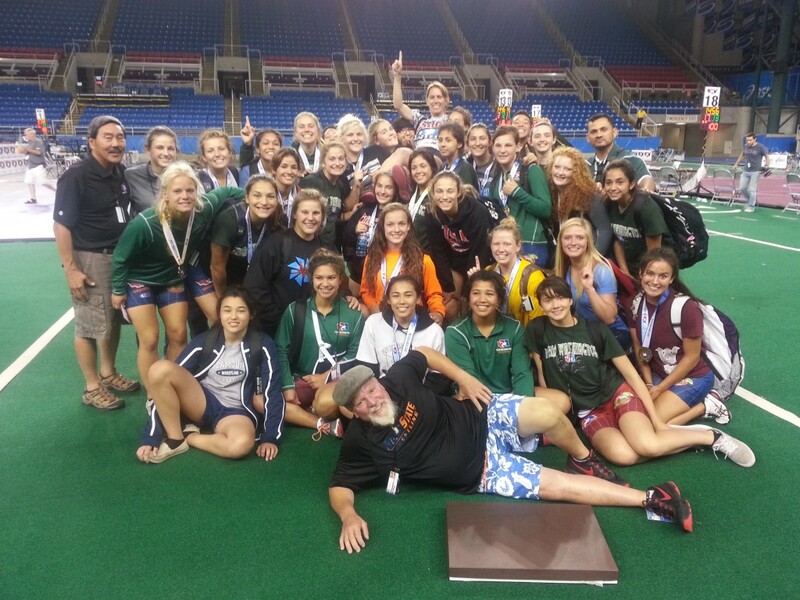 Washington Junior women are the 2014 National champions beating out California in the finals. Washington female cadets took 6th. The Schoolboy team (age 13-14 photo below) placed 8th in freestyle and 5th in Greco-Roman at the Schoolboy National Duals in Indianapolis, IN. The Cadet team (age 15-16) placed 11th in freestyle and 4th in Greco-Roman at the Cadet National Duals in Florida. The Junior team (HS grade 9-12 photo below) placed 11h in freestyle and 11th in Greco-Roman at the Junior National Duals in Oklahoma City, OK.